May is a fairly quiet month perhaps best known for Mother's Day, which takes place on the 13th of May 2018 and Worker's Day on the 1st of May 2018. Although flights are fairly affordable throughout the month, budget conscious travellers might consider avoiding travelling during the first week of the month and over weekends. Midweek dates are your best chance of securing the cheapest price available on each route, but for more specific dates look out for dates highlighted in green below. May is perhaps best known for Worker's Day on the 1st and Mother's Day taking place on the 14th of May 2017. Although flights are fairly affordable throughout the month, budget conscious travellers should avoid travelling on the 1st when a series of public holidays that created a mini break for SA's working class, comes to an end. 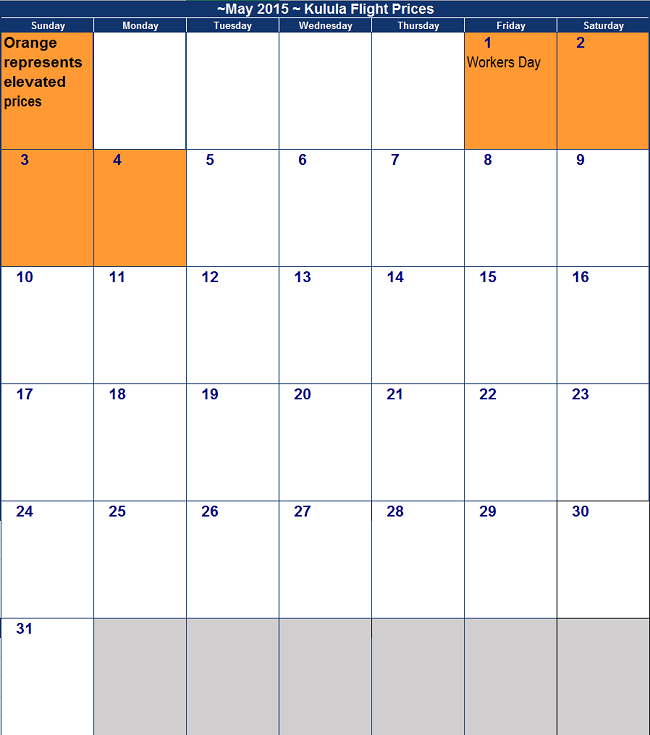 May is a quiet month on the South African events calendar, with only Workers' Day on the 1st of May and no school holidays. Luckily if you're in need of a little break, the 2nd of May is also a public holiday as the 1st is a Sunday, which does mean that prices on the 2nd are slightly elevated on most routes. Throughout the rest of the month you'll find affordable fares on most routes, with only slight elevations towards the end of the month on some routes. Keep an eye out for those dates highlighted in pink to avoid the most expensive flights. 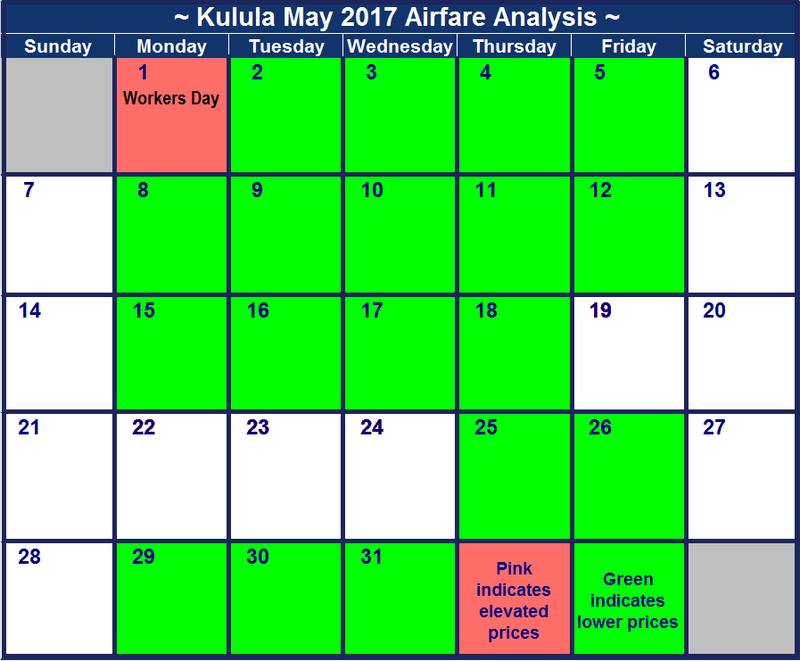 For your reading pleasure - scroll down to see the cheapest Kulula flight prices on each day of the month in May 2015. This was set up on the evening of the 29th April 2015, and the more time that has passed since then the greater the likelikehood that airfares have changed from those listed below. The only public holiday this month falls on the 1st of May, creating a much needed long weekend. The public holiday clearly pushes up flight prices around the beginning of the month on most routes, with the exception of the Joburg to Durban flights. Prices are relatively consistent throughout the rest of the month. Note again that all the airfares listed below may have changed since we published them (usually because of fluctuations in what Kulula is charging, sometimes because of mistakes we have made). This is not a Kulula Airlines flight special, just their standard pricing. Check current airfares at Kulula. Cape Town to Durban airfares have decreased somewhat since 2013. This airfare comparison excludes British Airways Comair flights - BA Comair are the full service sister brand of Kulula Airlines. The only public holiday in May 2014 is the 1st of May - Workers Day, and it does not create a long weekend, as it falls on a Thursday. This is probably why we don't see heightened airfares on the weekend of the 3rd and 4th May 2014. 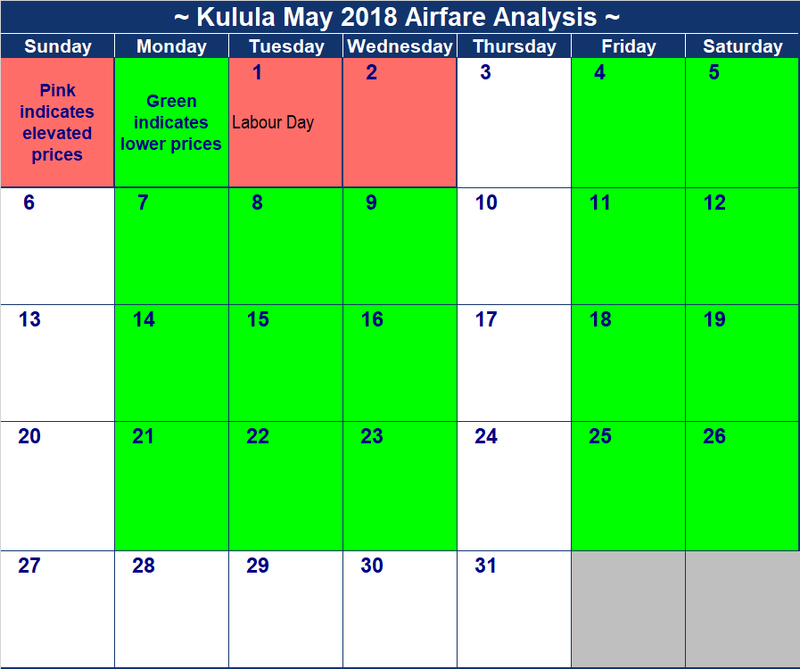 Generally speaking, Kulula's May 2014 airfares are higher than those from May 2013, with the exception of the Cape Town - Durban flight route, where airfares have come down somewhat; however they are higher than May 2012 (unsurprisingly, given the sharp increases in fuel prices). Kulula flights from Lanseria to Cape Town are generally cheaper than from OR Tambo to Cape Town; but the return flight prices from Cape Town to Lanseria are similar to Cape to OR Tambo. And really interesting to see that Durban to Lanseria is more expensive than from Durban to OR Tambo. This snapshot of airfares was conducted on the 28th March 2013. Airfares have obviously changed from the below since this was done. It's instructive to keep it here for historical reference purposes. 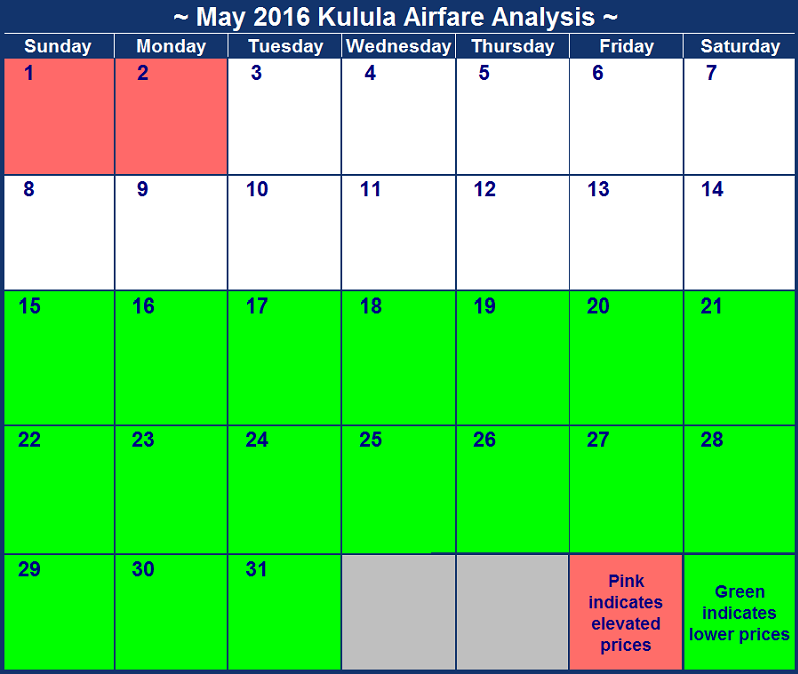 Here's the cheapest Kulula one-way flights we surveyed on each day in May 2012. This isn't a Kulula flight special, just a snapshot of prices. Make a reservation online at Kulula, but first compare flight prices. Prices will change (perhaps even by the time you receive this).